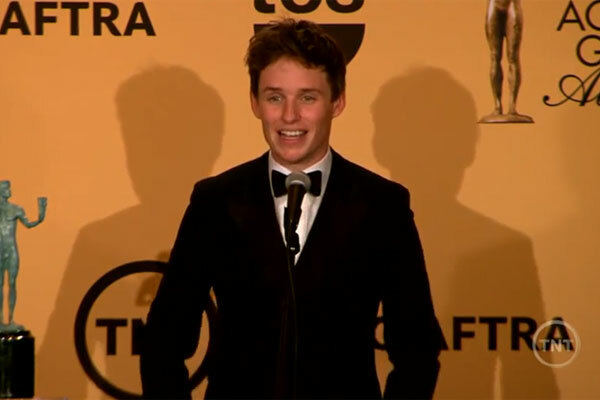 Home » Awards » SAG Awards Press Room: Eddie Redmayne, Viola Davis, the Cast of ‘Birdman’ and More! SAG Awards Press Room: Eddie Redmayne, Viola Davis, the Cast of ‘Birdman’ and More! Here are a handful of videos from last night’s SAG Awards press room where the winners have just been awarded their Actor statue and are ushered backstage to a flurry or reporters vying to get their questions answered. You can tell most are still a bit dazed that they won so watching these videos is always fun. Check out Julianne Moore, Uza Aduba, William H. Macy, the casts of Downtown Abbey and Birdman, Julianne Moore, Eddie Redmayne and Viola Davis below! And don’t miss all of the awards speeches!